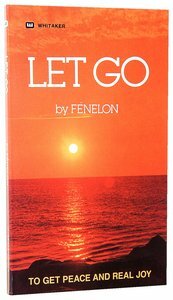 French nobleman and profound Christian thinker Count Fenelon provides a beacon of light to those who need encouragement. 95 pages, from Whitaker. Do you struggle through family problems, battle with the tensions of raising children, or find yourself overwhelmed with pressures on the job? Are personal failures and disappointments on the increase as you face each day? What a fountain of life it would be to discover how to let go of those distresses and learn to embrace the joy and peace that God has promised! F�nelon? ?with amazing insight? ?speaks firmly, but lovingly, to those whose lives have been an uphill climb and reveals just how to Let Go! Fran ois de Salignac de la Mothe-F nelon (1651 1715) was<P> the archbishop of Cambrai. He met Christian contemplative<P> Madame Jeanne Guyon in 1688, apparently appreciating and<P> affirming some of her doctrines and contemplative practices but<P> distancing himself from them on other occasions. In 1689 he<P> was appointed tutor to the grandson of Louis XIV. He became<P> archbishop in 1695. F nelon wrote letters of spiritual counsel<P> that are highly valued to this day. Customer Reviews For "Let Go"
Great little read, its onethat i have read again once i finished it the first time. What a great little devotional! I wish this book didn't end. It was practical and to the point.. helping to reveal true motives and intentions of the heart. There is definitely profound wisdom and truth in these pages.